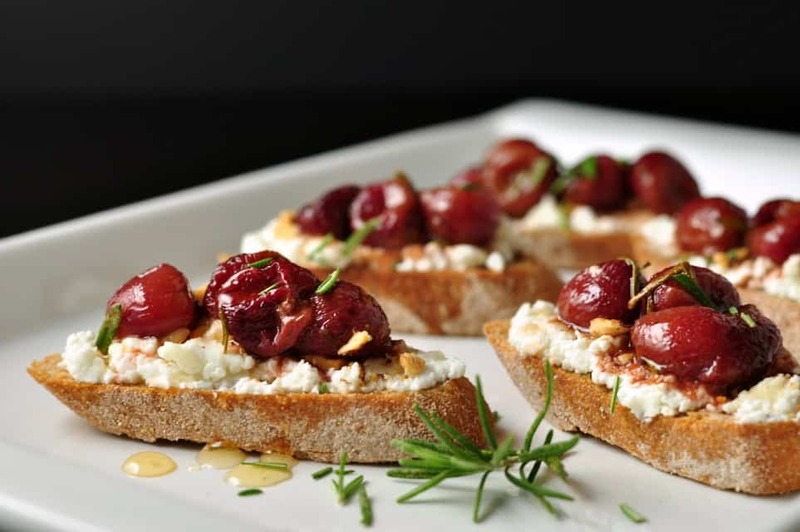 This Roasted Grape and Goat Cheese Crostini with hazelnuts and honey is an appy to remember! Soft, sweet warm grapes, nestled into creamy goat cheese, sprinkled with toasted hazelnuts, drizzled with honey, all on top of a crusty baguette slice–delicious! 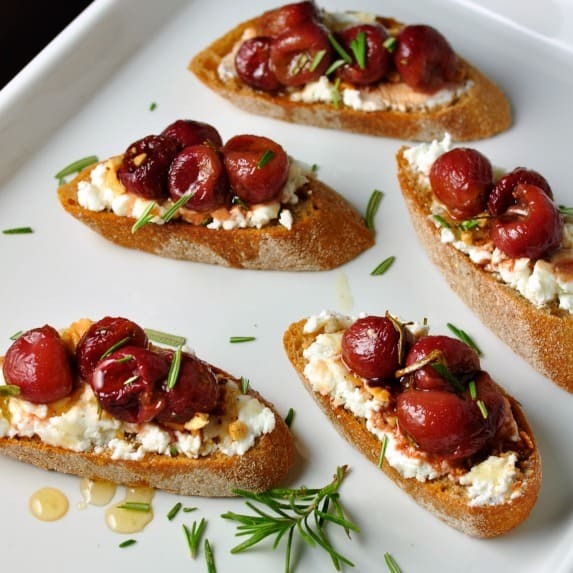 This Roasted Grape and Goat Cheese Crostini is surprisingly incredible! If given the chance, I could simply eat the whole plateful and skip dinner. 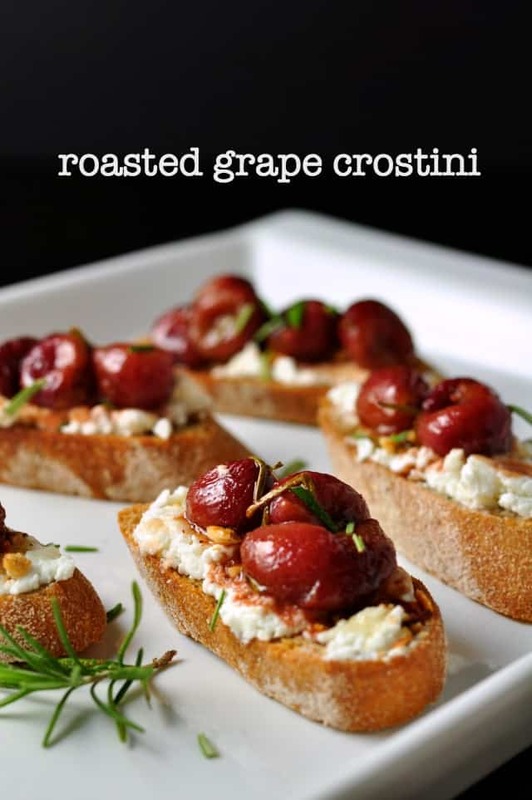 I was a little skeptical when I found recipes for roasted grape crostini circulating on Pinterest. I mean, who has ever heard of roasting grapes? But since I know that roasting brings out the natural sugars and enhances the flavour of vegetables, I decided to give it a try. 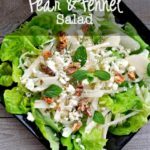 While some of the recipes used goat cheese, others used blue, ricotta or brie. I decided to just use the cheese, herbs and nuts that I like best. Soft, sweet warm grapes, nestled into creamy goat cheese, sprinkled with toasted hazelnuts, drizzled with honey, all on top of a crusty baguette slice–delicious! 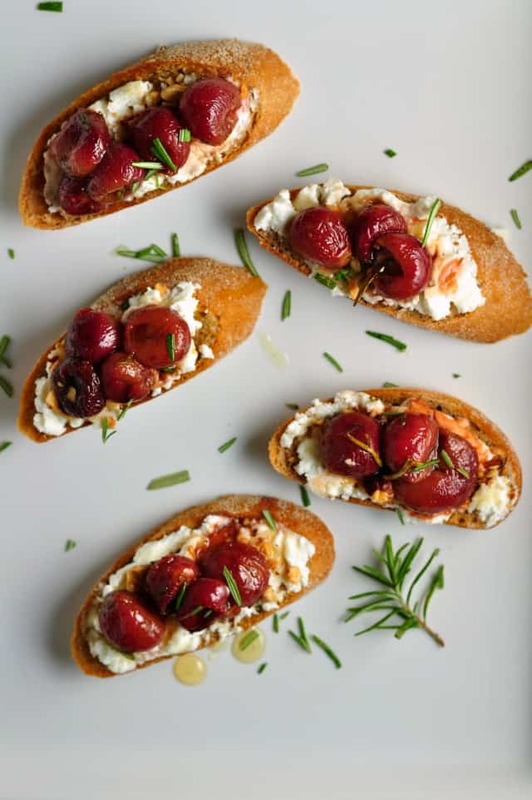 Try this Fig and Goat Cheese Crostini too, or see my other appetizer recipes. 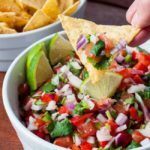 Looking for more crostini recipes? Check 5 Tips for Making Crostini. 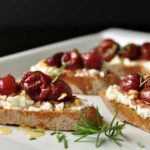 This Roasted Grape and Goat Cheese Crostini with hazelnuts and honey is an impressive appetizer for any time of the year. Wash and dry the grapes and remove the stems. Finely chop one of the sprigs of rosemary. In a small bowl, toss the grapes with 1 Tablespoon of olive oil, balsamic vinegar, the chopped rosemary, and a little salt and pepper. Spread on a parchment-paper lined baking sheet and roast until they begin to burst, about 15 min. Toast hazelnuts in the oven, remove after 10 min and chop finely. Brush a little olive oil on the baguette slices and toast in the oven for 5 min. Spread 1 Tablespoon goat cheese on each baguette slice. 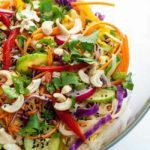 Sprinkle with a little chopped toasted hazelnuts. Press 3-4 of the roasted grapes into the goat cheese. Drizzle a little honey over each. Garnish with fresh rosemary and serve. Use a gluten-free baguette to make the crostini if necessary. 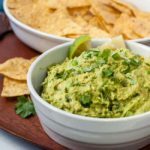 How do these taste after they’ve begun to cool? I’ve found they’re just as good cool. However, I wouldn’t make them the day before, as the cheese might dry out or the juice from the grapes might leak into the cheese and discolour it. I hope this helps!